We were there: Jeff Koons for H&M, pre-opening event! Polyglamorous was at the pre-opening H&M event at the company's Fifth avenue Flagship store with select art of Jeff Koons exhibited. It was an eagerly awaited event by all fashion insiders: the very first time the global brand has collaborated with an artist, rather than a high-fashion designer. Jeff Koons is best known for his "public sculptures, such as the monumental floral sculpture Puppy (1992), shown at Rockefeller Center and permanently installed at the Guggenheim Bilbao. 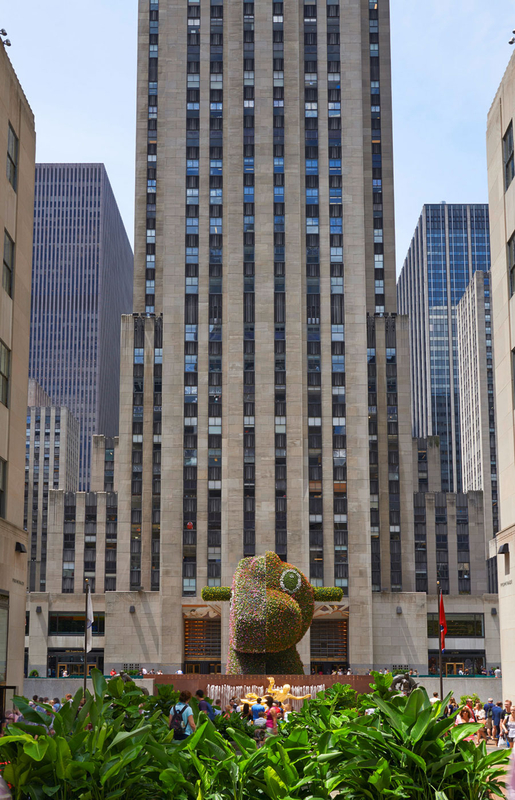 Another floral sculpture, Split-Rocker (2000), previously installed at the Papal Palace in Avignon, Château de Versailles, and Fondation Beyeler Basel, is currently on view at Rockefeller Center (through September 12, 2014)." Between June 27 - October 19, 2014, Whitney Museum will host "JEFF KOONS: A RETROSPECTIVE," the largest exhibit of Koons' work in New York yet. Polyglamorous will report! For those from Europe, the exhibition will afterwards move to Paris (Musée national d’art moderne, November 26, 2014–April 27, 2015), and finally to the Guggenheim Bilbao (June 5–September 27, 2015). Yesterday at the exclusive opening party, I was not only able to get some cool new clothes and jewelry, but I got my very own Jeff Koons' Balloon Dog Handbag. If you have a chance, you should visit the largest H&M Flagship store on Fifth Avenue and 48th Street and check out the exhibition and the newest clothes!